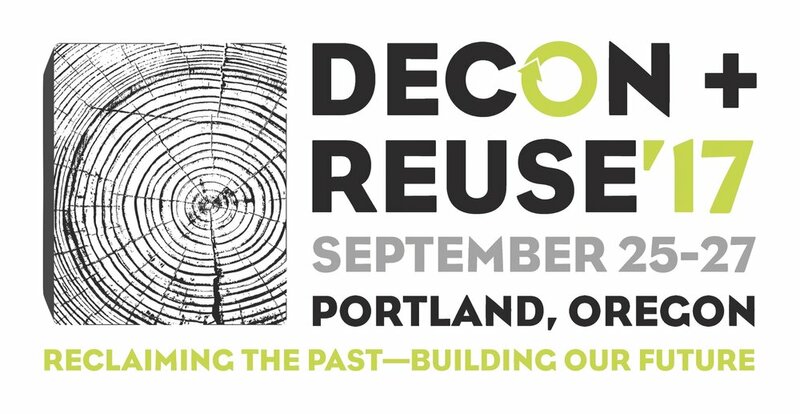 Portland has been chosen as the host city for this year’s Decon+Reuse’17 Conference, "a one of a kind meeting of deconstruction and reuse practitioners from around the world." The Chicago based non-profit, Building Materials Reuse Association (BRMA) is holding their annual conference in the Smith Memorial Union at Portland State University September 25th-27th. There are a number of interesting topics being covered over this three day stretch including talks from keynote speakers, Adam Minter on "Waste Doesn't Slide Downhill: Travels in a New World of Recycling and Re-Use,"and Jim Lindberg on "The Atlas of ReUrbanism." The ReBuilding Center is honored to be associated with this event and will be hosting the welcoming reception on Sunday, September 24th. This eventis not open the public, so make sure you register if you would like to enjoy the festivities, fine food, and beverages that will be offered, including a specially brewed beer from Stormbreaker Brewing just for us, the "ReLogger," to whet your appetite for the conference to follow. Older PostCheer RBC on in Design & Build Competition, "The Dropbox Derby"